It looks like Star Trek 4 may not be totally dead, as Simon Pegg says there's "a script that's been written." 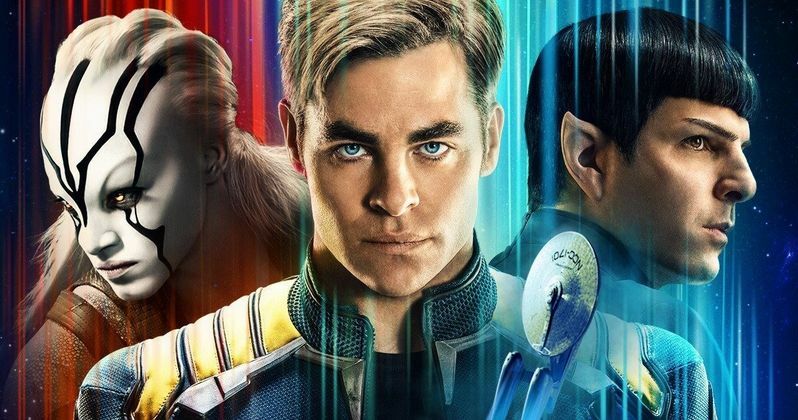 Following the disappointing box office brought in by Star Trek Beyond, which was critically well-received, the future of the franchise has been a bit uncertain. Now, we know that Quentin Tarantino is working on his own, possibly R-rated Star Trek movie with J.J. Abrams. But, since a script for Star Trek 4 is kicking around, Paramount has some decisions to make. Here's what Pegg had to say about the status of Tarantino's Star Trek Movie, as far as he knows. "There's also the story of Quentin Tarantino coming and chatting with J.J. [Abrams] about an idea that he's had for a long time. That idea is going into the writer's room to be looked at. I think it might take something like him to restart it...I don't know if that means everybody will be blowing each other's heads off with phasers and calling Klingons mother f*****s, but, who knows? That could be fun." Simon Pegg, who has starred as Scotty in the most recent run of Star Trek movies and co-wrote Star Trek Beyond, revealed this information at the Hollywood premiere of Ready Player One. Speaking of Star Trek Beyond, Pegg also discussed his frustrations with the marketing campaign for that movie, which he thinks may have led to its underperformance at the box office. "If you look at a film like Suicide Squad, that was around for such a long time before it finally came out and people were so aware of it. Whereas with Star Trek Beyond, it was left too late before they started their marketing push. It still did great business, but it was disappointing compared to [Star Trek Into Darkness]." Star Trek Into Darkness pulled in $467.4 million at the worldwide box office in 2013. Star Trek Beyond, on the other hand, managed just $343.5 million. Considering that it was a very expensive movie to make, that could easily sway Paramount when it comes to making Star Trek 4. Simon Pegg also talked about the use of Sabotage by the Beastie Boys in the trailer, which he says they wanted to remain a surprise moment. "I was really angry about that. [The trailer] used 'Sabotage,' which was our surprise moment in the end. It was supposed to be a very fun and heightened twist, and something that was a big surprise and they blew it in the first trailer, which really annoyed me." As for this Star Trek 4 script? Simon Pegg posted a photo of himself and Beyond co-writer Doug Jung on Twitter in late 2016, indicating that they were working on the next Star Trek movie. Apparently, they've at least finished a draft, which as reportedly going to bring back Chris Hemsworth as Kirk's dad. But at the moment, it seems like Quentin Tarantino's Star Trek movie has more heat behind it. We'll have to wait and see how Paramount wants to handle all of this. This news comes to us courtesy of Entertainment Tonight. Is Danai Gurira Ready to Beam Up for Star Trek 4?